Hondros + Where's The Front Line From Here? The BDC presents a special double feature of award-winning documentaries Hondros and Which Way is the Front Line From Here? 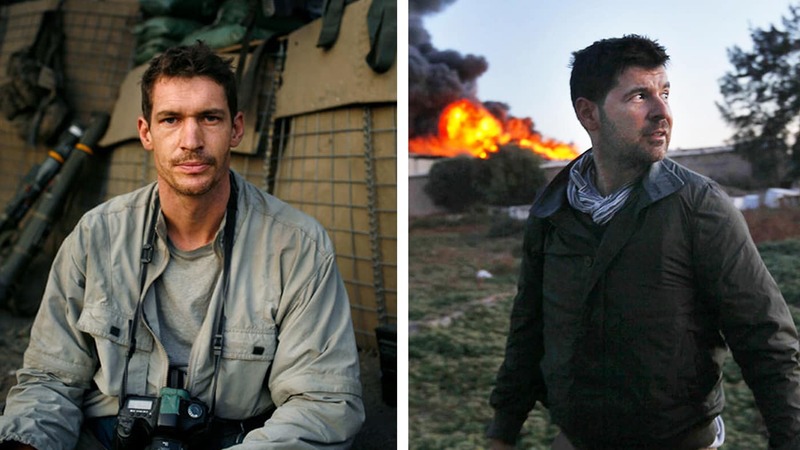 The Life and Time of Tim Hetherington. Hondros explores the life of photojournalist Chris Hondros, two-time Pulitzer finalist who was killed by hostile fire in Libya. The film directed by Chris Hondros’ childhood friend Greg Campbell takes viewers on a global journey to meet those in Chris's most influential photos, and to uncover their little-known backstories. The first screening will promptly start at 6PM. Light fare will be provided between screenings. The second screening will follow at 8PM. SEBASTIAN JUNGER is the #1 New York Times bestselling author of The Perfect Storm, Fire, A Death in Belmont, War and Tribe. As an award-winning journalist, a contributing editor to Vanity Fair and a special correspondent at ABC News, he has covered major international news stories around the world and has received both a National Magazine Award and a Peabody Award. Junger is also a documentary filmmaker whose debut film Restrepo a feature-length documentary (co-directed with Tim Hetherington), was nominated for an Academy Award and won the Grand Jury Prize at Sundance. Junger has since produced and directed three additional documentaries about war and its aftermath. Which Way Is The Front Line From Here?, Korengal and The Last Patrol. Junger has also written for magazines including Harper's, The New York Times Magazine, National Geographic Adventure, Outside and Men's Journal. GREG CAMPBELL is an award-winning journalist, author, and director, who has written for such publications as The Economist, WSJ Magazine, Paris Match, The Christian Science Monitor, the San Francisco Chronicle, In These Times and Amnesty Magazine, among others. He is the author of three nonfiction books, Flawless: Inside the Largest Diamond Heist in History, The Road to Kosovo and Blood Diamonds. The latter served as inspiration for the Oscar-nominated 2006 film Blood Diamond starring Leonardo DiCaprio and Jennifer Connelly. Campbell is also a producer and director, known for Hondros, Chain of Command, and Surviving an ISIS Massacre. He has won more than two dozen journalism awards from the Inland Press Association, the Society of Professional Journalists, the Colorado Press Association, Colorado Associated Press Reporters and Editors, and the Association of Alternative Newsweeklies.